BoardGaming.com> Games> Board Games> Run, Fight or Die! 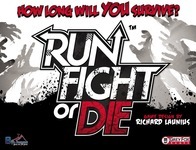 Run, Fight, or Die is an adventure dice game for 1 – 5 players taking on the role of a heroes or heroines stranded in a small town that has mysteriously been overrun by zombies. During the game players will work to escape the town, saving as many terrified townsfolk as they go. These townsfolk become followers and bring their skills, and often problems, along with them – forcing the player to adapt to their party as they flee the zombie infestation. Each follower will provide victory points to the player: the more beneficial followers provide less victory points while the followers that present penalties provide more points. As soon as the game ends, players total their individual points (which will include their followers and their remaining health) to establish the winner. I have the feeling about this games that wether or not you like its mechanics, the three add up some fresh air to the Zombie theme, in which since Last Night on Earth really blast me i though i was found the forever fav zombie one. Now LNoE is needing to fight to retain his place. – You throw your dice, including an event die which will trigger some effect after your first roll, then you have two rerolls for your 5 action dice to look for your needs or strategy. For winning you need VP, and they come mainly from taking followers with you, each having it own VP value from 1 to 6. If the value is low the follower will have some advantage, if the value is high the follower has some penalty. For me the great issue about the game is that you will spend most of your time and resources trying to stay alive! Hitting, shooting and running from the zombie horde slowly and rentless coming at you. While none of all this stressful activity is giving you any VP, so not putting you in the road to win. If you want to get some VP, eventually you will have to take some risk, give up worring about those zombies and stopping in your way to enter some location, take some event of directly rescuing a follower. And normally making this on one of your turns will cause an increase on the number and a decrease on the distance of your hunters: the next turn you will have to FIGHT! RUN! or…. DIE…. Finally i have to say that there are different events that will trigger the end game. In our case it has been 100% the dead of one player… Point in our feeling is that this dead could come from a lot of unexpected events (we completely dislike for example the event die result of taking one wound) and the game is becoming ‘ok, up to now i am the one with the most VP, so instead of continue working for a direct win i will focus on staying alive waiting for another player death’ Probably we will be house ruling some issues to avoid this kind of play. Run, Fight, Or Die is fun enough game where you press your luck through multiple re-rolls. In it, each player takes a three tier game board (representing zones of nearness – close, medium, and long), populates the board with 9 zombies, and takes on the role of one of six characters that come with the game. Each individual character has different strengths and how you tackle the game might depend a little bit on character, but regardless there is going to be a lot of baseball bats, pistols, and firebombs used on zombies. As part of your turn, you roll an event die (which is only rolled once) and you roll 5 action dice – or maybe 6 if you are told to. The dice fundamentally are used to generate killing power to reduce the number of zombies that you face, but they can also trigger events, move you to new locations, and help you find useful or perhaps worthless followers. Which leads us to the goal of the game. You goal is to reach the town limits with as many followers as you can find. The followers help you score points. What are dead zombies worth, you ask? Not a thing. Zombies simply slow you down – or eat ya. Each player’s turn is very fast, but even so, I personally will not be using the 5-6 player expansion because I don’t need the extra down time. On a positive note, it has solitaire play and you basically play for points and try to set a new record. I find it fairly engaging and a nice way to spend 20 minutes or so. ‘Run, Fight’ or Die!’ is a great little press-your-luck dice-rolling game that will scratch the ***************** itch without a huge investment in either setup or play time. Even with many players, the turns pass quickly, without the feeling of downtime associated with other zombie apocalypse games. The components are cool, from the plastic miniature zombies to the customized dice. The artwork on the cards and boards is nice, edging toward the humurous rather than the horrific. The rules are simple and easy to learn and the game is great fun for adults and kids, alike. Add a Review for "Run, Fight or Die!" Kickstarter, Run Fight or Die!  Run, Fight or Die!